I’m not sure if this is the best place to ask this or if I should make a separate topic. So far in my journey, I’m leaning toward shake and vape because from one day to the next I’m never sure what I’ll have a taste for. A lot of the B&M juices I’ve had start to taste muted or dull after I’ve had them too long. It’s not vaper’s tongue, it’s more like a crisp fruit salad with well defined separate flavors that I vaped half of last month has now turned to muddled weak flavored jello. This is happening with professional juices so I’m hesitant to mix a large batch of anything being so new to DIY. My thought was to mix larger batches of single flavors then combine two or three in a 10 mil as needed. Will this allow the true nature of the flavor to settle into the VG without having the combo grow muddled? Will that work for steeping creams and bakery flavors so I can add a fruit later? It’s perfectly fine to post to this thread as your question is SnV based. I think over time many flavors do muddle as you say. Even single based flavor will especially if your intending on putting them in vg only. However making single based flavors and mixing them as you like is a great way to learn your flavors and then you can start combining them to advance you pallet you’ll start to know what flavors you like when paired. Like Banana Cream TFA & Strawberry ripe TFA taste good to me and then I know I like not only the ripe strawberry but I like to add a sweet Strawberry to add an additional dimension to the mix over time you’ll be mixing more & more flavors before you know it you’ll have a 5-6 flavor recipe. Although SnV recipes are usually really simple 1-4 flavors less complicated. Creams get much better w/ time and really vary upon what you want as far as profiles go. I wouldn’t recommend going about mixing your creams this way. Add the % you want to a mix is a better way. The amount you’d have to use of a premade cream base would be more confusing than it’s worth and your batch size would be much greater than a 10 ml. My tastes can be so fickle one day to the next. My thought was that eventually I’ll get for example a strawberry single flavor that’s right in a good zone for me. I hope to also find a nice cream that’s good as is, probably using multiple flavors to achieve what I like but this will need to steep and I’m still playing with this idea. This is all hypothetical at this point, lol. Then on Monday I love my strawberry as is but Tuesday I’d like a little cream with it. Wednesday I’d like the cream to have a hint of strawberry. Thursday I’m off the strawberry kick altogether. By the next time I’d like this, a combo of a larger batch will be muted but if I have them mixed separately, will that work? Having them separate won’t necessarily save them from being muted as everything over time mutes. It’ll extend them for sure but for how long you’ll have to judge that for yourself each person is different. What I think is full strength and tasty you may find it dull and weak. I get your idea and I hope it works for you. I have plenty of batches over 2-3 months and they all taste fine. you’ll find what works best for you especially if you need them to be at their freshest then SnVs are the way to go for you but a lot of us will say you’re missing out there’s some really great mixes that are mind blowing w/ just a months steeping time & continue to get better & better. I find that if I vape half a bottle and put back I don’t like the result either. I think the air destroys some elements for me. But age’ing a full bottle is something different. I do find that some of the zing’pop’woza goes…but I find the end results better. Bakery notes appear vibrant. Creams hide better for one that you don’t indend to see, fruits blend better rather than fight to be on top… And so on. So I am in the same boat kinda. But once you go down the rabbit hole…for me Atleast…I love mixing but I don’t have the time to do it everyday. More like every other week. Once you have enough supplies you will be well stocked. I do envy those who can shake and vape all the time. Some of the recipies I find and have are better at 1-5 days. But just don’t have the time. I never thought I would have more than 14 bottles November of last year. 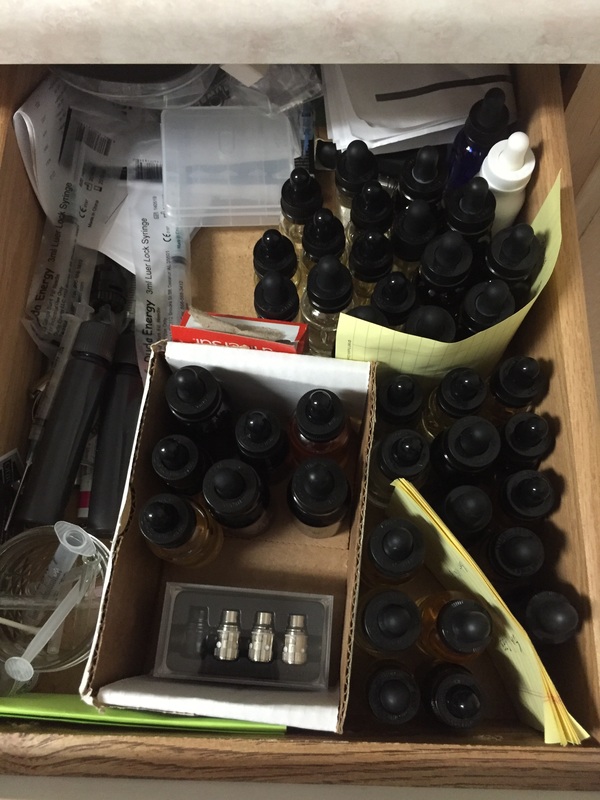 Welp here is a pic of my vape drawer. There’s 20 clean new empties sitting on the counter, 4 full 120ml jars hiding somewhere else, and 6 that I am actively vaping in my go bag. I vape something new everyday. @Amy2 Thanks so much! Yeah, I fully intend to try a lot of the recipes that need to steep for varying amounts of time. What I’ve accidentally learned though because I use tanks, is that two recipes can be great together half and half in my tank just for one day. But they turn to shoe polish if I mix them ahead of time and leave them sit too long in a bottle. Over time, considering my budget and vaping style I’ll probably develop a wide range from shake and vape to marking my calendar, lol. @Chrispdx I’m definitely down the rabbit hole, lol. That looks about like mine as far as the vapable supply and equipment. Most of my mixing stuff is now filling one of those Tupperware drawers on wheels kind of things you get at Walmart I’ll have to get pictures I guess. I can’t mix everyday either due to grandchildren and various distractions. I tagged you on another thread So that Joy may be able to offer her experience w/ single flavor mixes. She mixes kinda like what you were saying having them pre made and then she just fills up her tank day to day w/ what she feels like at the moment. Lol. Yeah what @Amy2 said. @Joy has a great concept she follows. Some are private some are not on ELR any more it’s an old thread I try to add back to it when I can. If you remember the name of the recipe I can check. Sorry ! I started it forever ago and last fall I ended up selling a bunch of recipes so unfortunately I was unable to share them and those are most likely the ones taken down. I still enjoy reading them especially if you want a satisfying SNV recipe right now ! I did your CRONUT yesterday and vaping it right now In my “black box” are a collaboration betwen you and Darth … the Sister’s Coconut Berry Custard steeping on the second week … ohh and I have _Ylang Ylang flower_ready to vape Life is good. Aw I’m flattered I hope you enjoy them all ! I recently made Cronuts haha every now and then I just gotta vape it but I don’t wana get burned out on it. It’s a treat ! Oh Ylang Ylang …stay tunned I’ve got a few more steeping that I think will be special ! @jj66 if you like Ylang Ylang you may be interested in this thread where Darth Vapor & I talk flowers & plants Floral and Flora !!! Ylang Ylang, you (or who ever whrote it) are right, it’s a love or hate flavor - I love it. Needed to be used with care … and as you whrite in the recipe, if I remember right, next time I make the flower I will lower it. Totally agree love or hate flavor for sure ! I love it ! Definitely start it off lower if your new to it and then once you’ve gotten accustom to it then start increasing your %s I say the exact same thing for FA’s Summer Clouds.